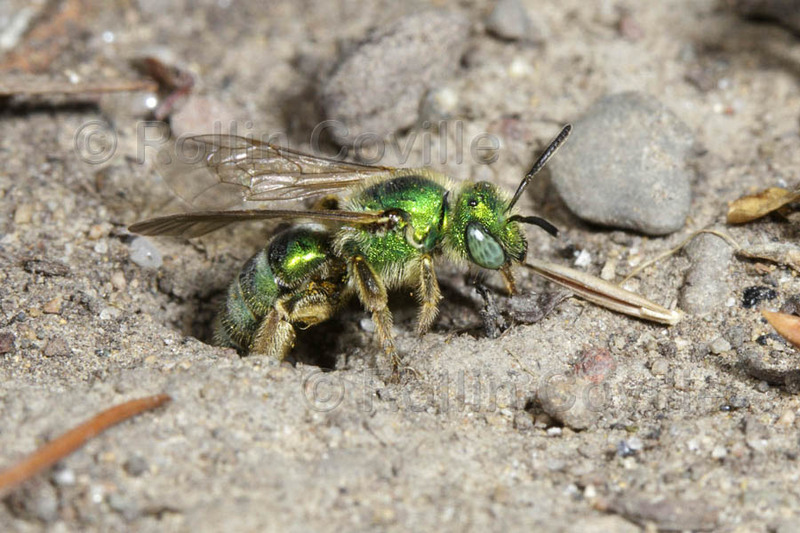 An Agapostemon texanus emerging from her ground nest. You happen to be one of the many ground-nesting bees that looks for garden sites for digging small tunnels where you will lay your eggs in individually-made brood cells that you will provision with pollen and some nectar. 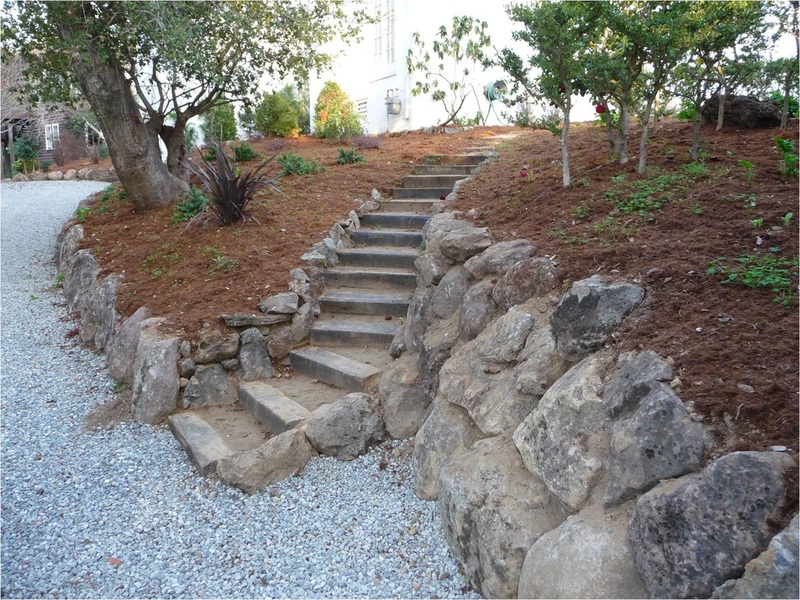 But something has happened in recent years to those favored bare dirt sites that makes your task much harder and oftentimes impossible. MULCH MADNESS has arrived and has become a highly promoted “eco-friendly” method for suppressing weeds, conserving water, and unknowingly discouraging ground-nesting bees! Equally bad for ground nesters is BPI, or better known in the trade as Black Plastic Insanity, that is, the laying down of plastic products over bare soil to accomplish the same goals as MM. So what is the big deal about bare dirt and bees? Between 60-70% of the native CA bee species dig tunnels in soil and provision a series of nest cells, each of which will contain one new bee offspring. To do this the female must find a patch of bare dirt, excavate a tunnel and then make repeated visits between the tunnel entrance and flowers for their pollen and nectar. If a nest-searching female encounters 1-2 inches of mulch or plastic where there should be bare dirt, she will not excavate through this material and will leave in search of an appropriate site. When a high number of gardeners in an area mulch or plasticate their soil, this can have a negative impact on bee populations. In a recent casual survey of 200 gardeners in the SFBA from 40-60% said they were mulchers! To put MM and BPI into context, consider all the other challenges that urban bees face. There are numerous natural enemies of bees that include hungry birds, spiders, and a variety of predatory insects. One could then add the high number of exotic plant types (about 95%) that urbanites use in CA gardens that are of little or no food value to bees native bees prefer native plants over exotics by a very high margin). Then come all the chemicals that urbanites use to control or enhance this or that problem, many of which are toxic to bees. Finally, MM and BPI get added to the list of all the other areas in urban environments that are covered: pavement, concrete, building footprints, lawns, etc. It is amazing that bees colonize urban areas. If they only had the knowledge that we have! So, what to do about MM or BPI? In our small experimental bee-plant garden at the UC Berkeley Oxford Tract our main goal is to develop practices that encourage native bees. We don’t use synthetic chemicals; we plant lots of attractive natives and a few attractive exotics; and we don’t use mulch or plastic. We also hand-weed and water. Many home gardeners many not be able to adopt all of our bee-friendly practices. So, our recommendation is to set goals and keep synthetic disruptions at a minimum if you want to encourage interesting wildlife in your garden. In the case of mulch and plastic, if you must use it, do so sparingly, leaving about 50% of your garden in bare dirt – for the bees and other useful organisms.